-Soak the glutinous rice in the bowl of water and leave it overnight or at least 2 hours. -Mix the chicken thigh garlic, curry powder, sugar, salt and pepper in the bowl and marinate them overnight or at least 2 hours. -Once ready to cook. Mix the paprika, dried mix herbs with the breadcrumbs on a plate. Then mix the flour salt and pepper on the second plate and lastly, the beaten egg in a separate bowl. -Heat the oven to 200 Celsius. -Dip the chicken in the flour then egg and breadcrumbs. -Put the chicken in a heated pan. Fry until the breadcrumbs turn slightly golden brown. -Transfer all the chickens onto a baking tray and bake them for approx. 17-20 minutes. -While waiting for chicken to be cooked. Drain the excess water from the rice then wash the rice for 2 minutes. -Put the glutinous rice in the microwavable bowl add 190 ml of water and cook in the microwave for 10 minutes. 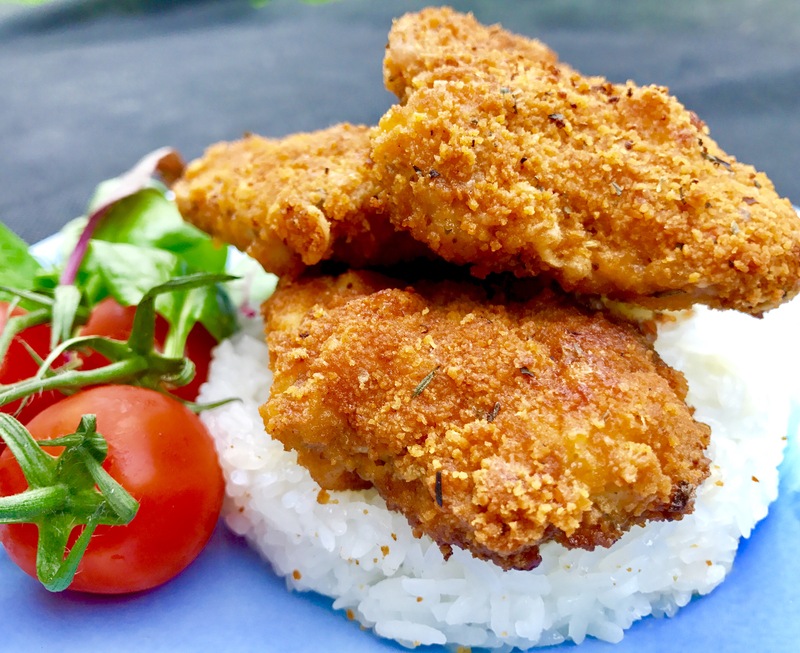 – Once chicken is cooked, put it on the serving plate with the sticky rice. Accompany with salad or vegetable of your choice. 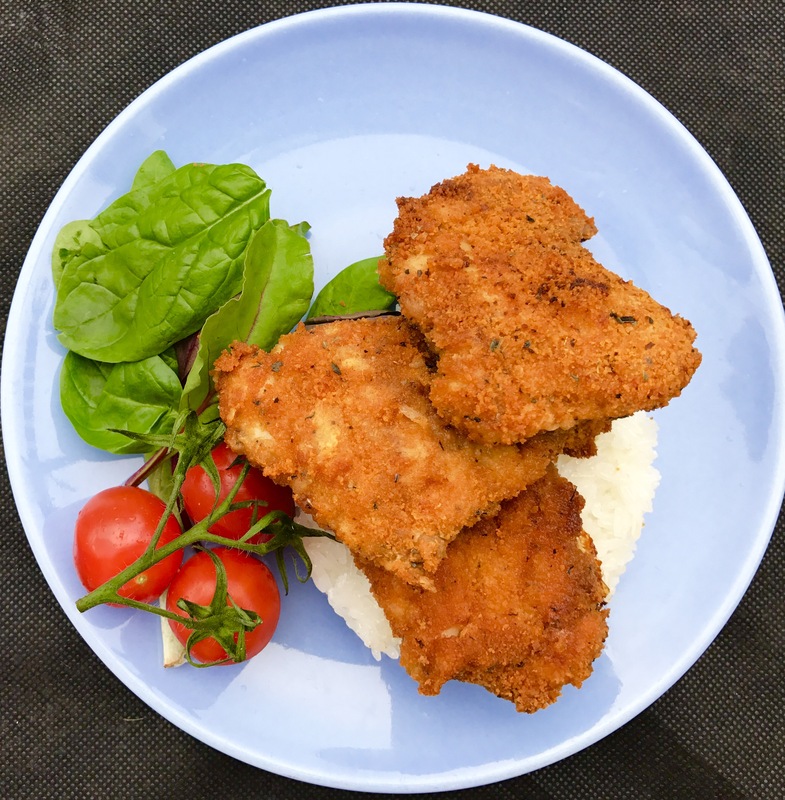 -I highly recommend serving Crispy Chicken With Sticky Rice with the tamarind dipping sauce or at least the chilli sauce. -Please check my classic sticky rice recipe for the alternative cooking method. In which you can cook the sticky rice in advance and reheat when required.Happy cooking 🙋🏽.